If you have been longing for a post from Daisy Bites for some weeks now, and were elated to see my Guatemala post pop up in your reader, or inbox, or Facebook news feed, imagine how I feel. I have been going through some serious baking and blogging withdrawal these last few weeks. Between travelling, and dieting, and training for my triathlon (T-25 days! ), there has not been nearly enough time to dedicate to my beloved blog (beloved to me, that is – I don’t know how you feel about it!). That, and Christian and I just started season 1 of Game of Thrones when I got back from Guatemala, and every time I sit down on the couch, he cons me into another episode (seriously- he sounds like a little boy asking his mom for a dollar for the ice cream truck). Side note: There is such an intense satisfaction when you click that “publish” button, knowing you have submitted your writings to the blogosphere, for all the critiques, approvals, and commentary. It is strange, but I get such a rush from it…and I have missed that over the last few weeks. I was especially nervous for my Guatemala post because I knew there would be many people reading it who knew intimately know the family details and would know if I messed things up (which I did – my mom told me – oh well!). As you may know, I FINALLY bought a KitchenAid stand mixer, and – though I am ashamed to say it – it took me several weeks to use it! That all changed this weekend though, so no worries! My baking dry spell ended and I even managed to find some (somewhat) healthy recipes. But I will get to that when I get to that (maybe tomorrow…). 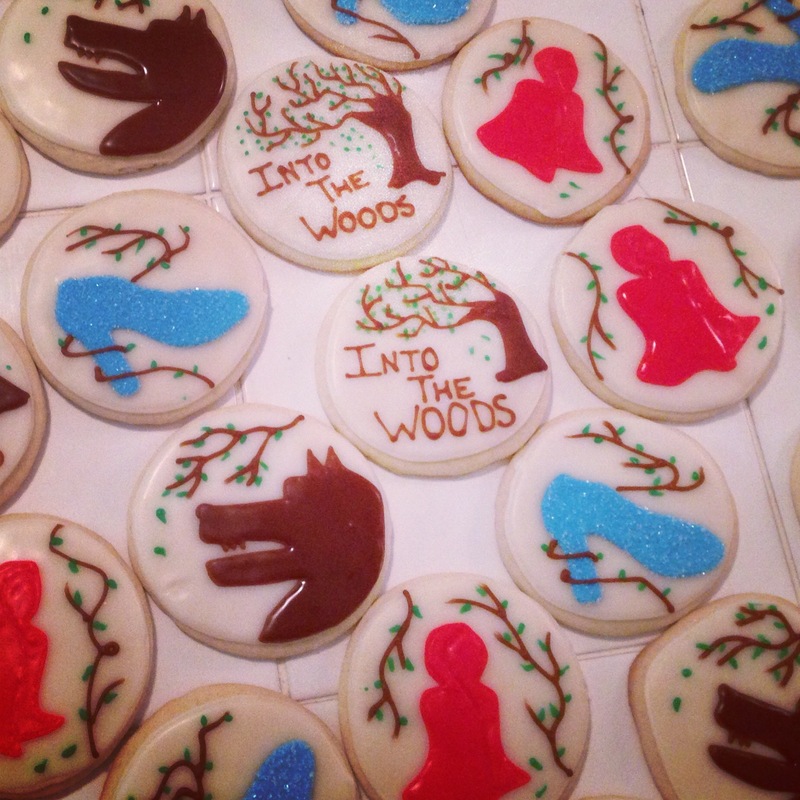 I wanted to give a little bit of baking love and show you the cookies I baked for my mom’s middle school’s production of Into The Woods. In case I did not mention it, or you forgot, my mom signed up to direct her middle school’s annual spring musical. In the end, she pretty much roped in the whole family: My Aunt Susie directed, my mom was the musical director, my sister helped with choreography, hair, and makeup, my dad helped with sound, lighting, set, and other behind the scenes stuff, and my brothers even showed up from college now and then to help with behind the scenes crew stuff as well. As for me? 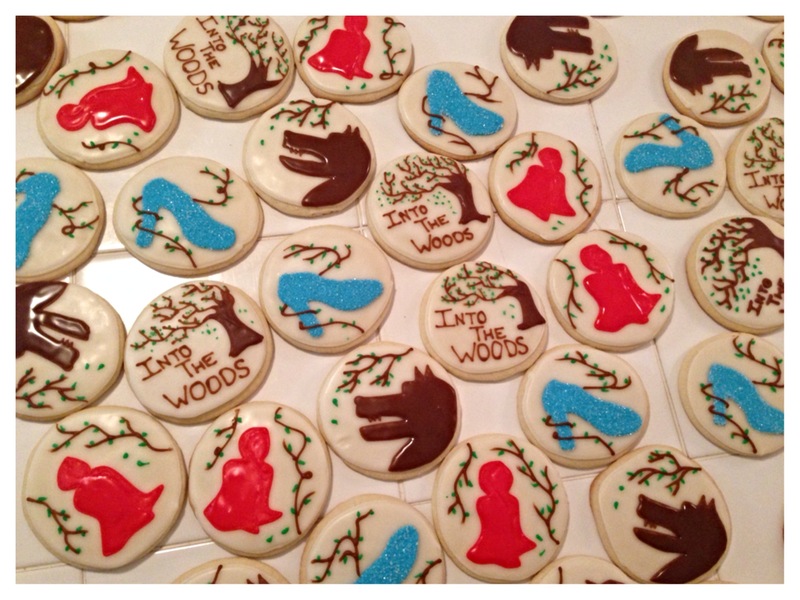 I contributed in the best way I know how – I baked (all profits benefitting the middle school’ production, of course). I made my classic sugar cookies to sell at concessions at the shows. 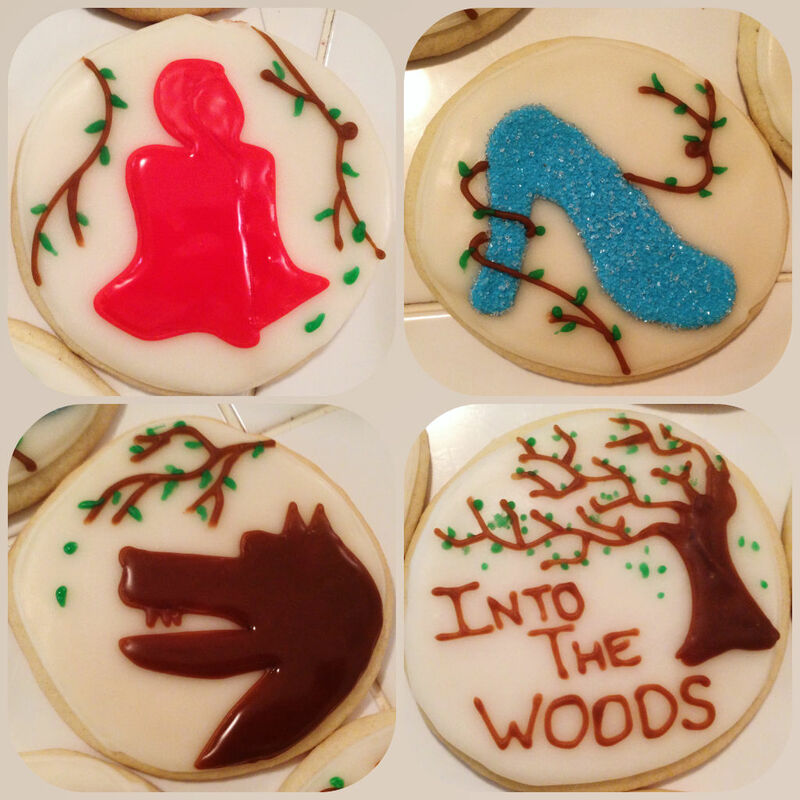 I decorated 4 different designs which I thought best encompassed the play and would look good on a cookie: an Into The Woods logo I created, a wolf, Little Red Riding Hood’s cloak, and Cinderella’s glass slipper. The glass slipper was my favorite because I put blue sugar on them to make them sparkle. And anyone who knows me knows how much I love sparkles. I’ve been trying out a new icing recipe, which is a little different from the royal icing I used to use. I really like it because it is just as durable as royal icing, but it is softer to bite into. The only thing I don’t like is that this cookie icing seems a little more transparent than the opaque royal icing I’m used to. I think I can remedy this by adding some white food coloring, or maybe I just did not mix the icing long enough. Or maybe it’s the amount of corn syrup I use. I will have to experiment with my next batch! If anyone has suggestions or insight as to why my icing was more transparent, I’d love to hear it! As for the play? It was adorable and everyone loved it and the kids (and their fabulous directors) did a wonderful job!